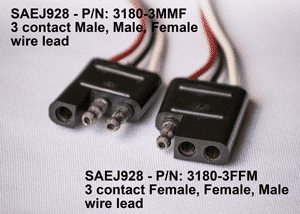 United Universal family of molded trailer connectors – Series 3180. 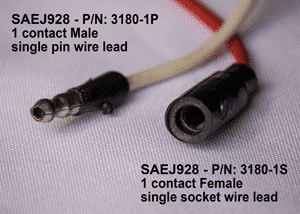 The contacts conform to the SAE, J928 standard. They utilize tried and true .180″ diameter pin and socket contacts. Customer specifies size (i.e. : 18ga.) type(i.e:GPT),length of wire/cable(i.e:6ft). The 2 contact configuration is the most popular. 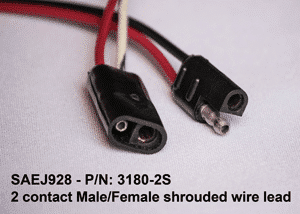 It has a unique hermaphroditic feature where any 2 connectors can be mated to each other. 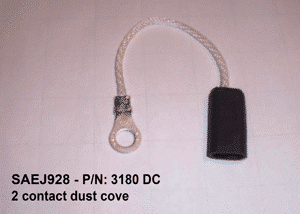 This configuration is available with 2 single conductor wires or a 2 conductor jacketed cable. They are available in a variety of conductor sizes. 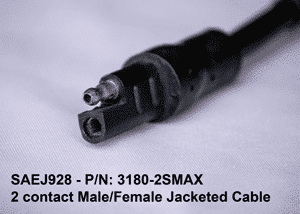 The standard connector is considered “weather resistant” when properly mated. 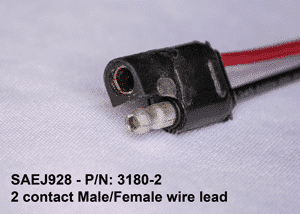 The 2 contact shrouded connector obviously mates with the standard 2 contact connector. A mated pair of the standard and shrouded connectors could be considered “weatherproof”. This product is currently limited in wire sizes #18 Ga. single conductor . Please check for details.